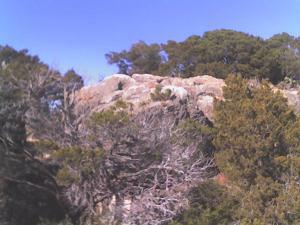 Started at Lakeside village and found a trail to top of Powelldale Mountain and another along Brazos River/ Lake Whitney. There has been no improvements to this area, trailhead not easy to find and trail overgrown with weeds. This was not a good place to hike as dead dear carcass and someones excrement littered entrance to trailhead. However the views on top the "mountian" was very good. Will get pics up soon. still waiting, trails could be a year away, however nothing like hiking along the brazos river and Ham creek though which I thoroughly enjoyed on a beautiful winter day, I scared up lots of birds to few little furry animals along the way. Shore and boat ramp popular amongst local fishermen on anyday. No one hiking around except me though on this day. Park is under reconstruction after years of neglect. Shaping up well and someday will have over one and half miles of trails for hikers, mtn. bikers, and equestrian riders. Wildlife was definitely there! While hiking around park on Fossil Ridge, Upper spillway trail, Coyote Run and Whispering Meadows, I saw a 3 foot long snake (no rattle), many birds including turkey vultures, ducks and a hawk, and lots of squirrels. And after dark I drove by a possum near lake, a bobcat at the dam and three does near entrance. I hiked the recently blazed Blue/White trail from Public campground #4. This is new and goes up Johnson Peak, (350+ foot hill above lake). The other trails are east and go up Redbird Hill (topping around 200 feet above lake). White and Blue ribbons mark the trailhead off a dirt road that leads to campsites just east of the boat ramp road. The trail is roughly 3 foot wide and cleared well w/ good views of lake along the way and is mostly dirt and some rock surfaced. There is another trailhead for Johnson Peak on Park Road 36 past the church. Across the hwy and on the other side of the church is the Redbird trailhead. I never met a person along this trek but did hear some hikers and kids coming up from the other trailhead on this cold, clear day. From the peak I could clearly see the state park, the rest of the pennisula, the bends of the lake, Hells Gate, the Cliffs, McAdams Peak and even Schoolhouse Mountain. What a view!! Took an old trail used to be the north trail but got lost and went down mulberry and bluebonnet and lookout. Fall colors were great, lots of Red Oak leaves and I really had to stop and admire along the way. Lots of birds again in area but also some bunnies as it is easier to see the little critters scurrying about w/o some leaves to hide under. Fall was just beautiful this year here.